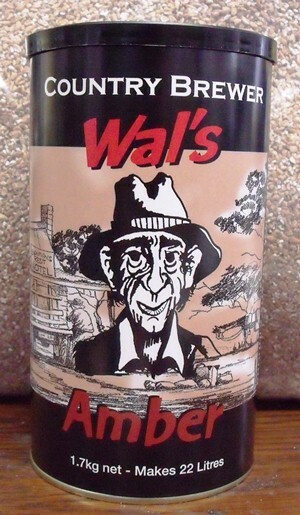 Wal's Amber Ale is a delicious ale with deep amber colour, creamy head and distinct citrus notes to its flavour and aroma. This is a cracking beer to use as a base if you want to experiment with different kinds of Hops. Just it to try and create my own version of a James Squire Hop Thief by adding some Fuggles & Amarillo hops. Check this out..a bit more expensive, but a very special one! Just buy 2 cans of Amber, mix in 22L and use one of the 5 gr yeast. No need for more sugars, boosters, herbs etc.. Very much as described. Rich hoppy, citrus aroma and taste. Quite sweet and deep amber colour. Creamy head and good retention. Brewed to 24L mark, yielded 58 bottles. Fermentables used 500gm LDME, 500gm Dextrose, 250gm Maltodextrin..Also added 10gm of Amarillo Hops. Kit already had rich hop aroma (richer than most kits) extra hop is for 'Hop Heads' only. Click the button below to add the Wal's Amber - 1.7kg to your wish list.